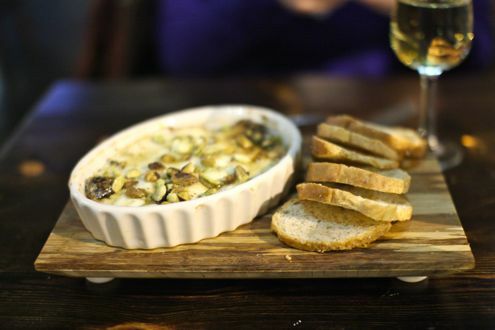 Brett and I were able to check out Tel’Veh, the relatively new wine bar and cafe located near the Verizon Center, a few weeks back. 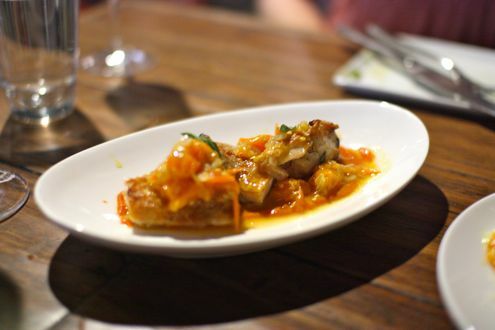 The restaurant recently announced a new executive chef and wine manager, and they invited us down to try out several items on the menu along with wine pairings. (Full disclosure — this meal was provided by the restaurant). The new chef at Tel’Veh is Dimosthenis “Dimo” Kolouas, who spent time previously at Kellari Taverna. 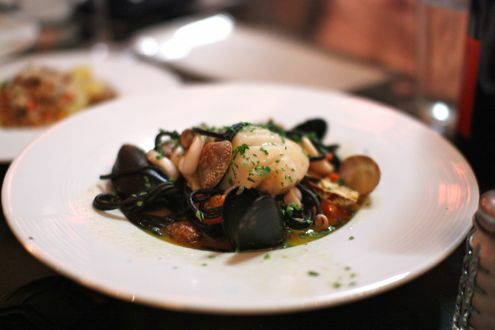 Not surprisingly, the menu has a clear Greek and Mediterranean focus, with the extensive wine program emphasizing pairings with the small plate offerings. The nice thing about Tel’Veh is that they offer 48 different wines by the glass through taps so you can try wines in 2, 4, or 7-ounce pours. We decided to go that route and had the waiter bring out wines to complement the dishes we ordered. First up was a set of oysters. The ones we tried were Caribou, Fire Lake, and Malpeque, the latter of which were easily the largest oysters we have ever come across. They were accompanied with a nice house-made cocktail sauce with some roe garnished on top. 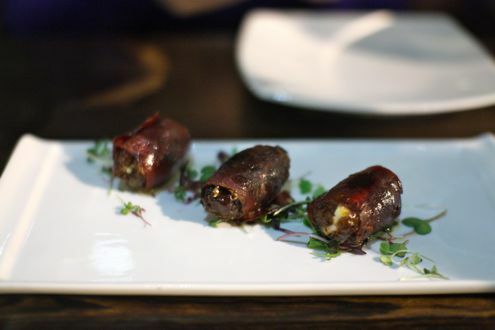 Next were goat cheese stuffed dates wrapped in pastourma, which is a Greek type of cured beef. I’m definitely a sucker when it comes to dates stuffed with cheese and wrapped in any type of meat, and these were impressive. 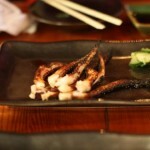 We then had the grilled octopus. 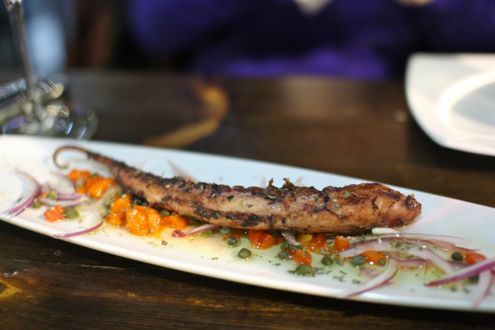 This was excellent and you could definitely tell the dish came from a chef trained in Greek cooking, as it tasted very similar to the style of octopus that we ate when we were in Greece a few years ago. 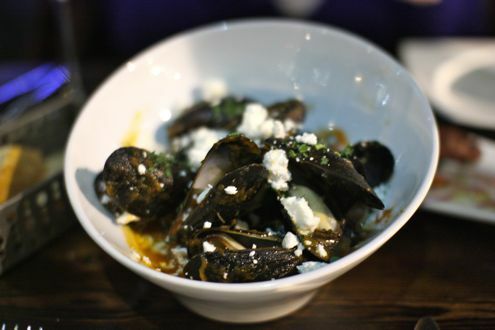 Up next was a bowl of mussels with goat cheese and a tomato broth. The chef recommended extra bread to sop up the sauce, and he wasn’t kidding. The best part was definitely the sauce that came with it. 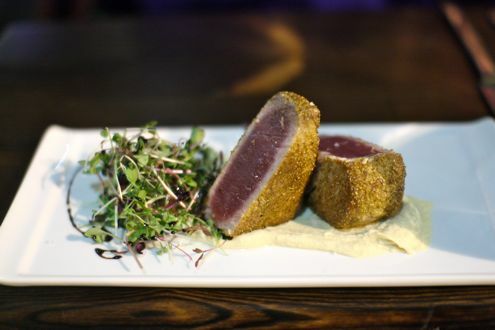 We then had to try the ahi tuna, since after being pregnant I’ll definitely have ahi any chance I can. I was a little skeptical after reading the description of ahi tuna over hummus, but the flavor combination actually worked and they really balanced each other. 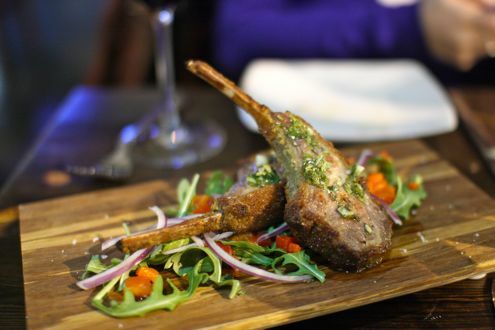 Our heaviest dish was the herb-crusted rack of lamb. The crust really added to the flavor and they were moist and delicious. One for each of us was the perfect amount. For dessert, we shared a dish of warm baked goat cheese with honey, dates and pistachios, as well as a crepe with hazelnut and berries. We were pretty full by this point, but were tempted to try each of them. The goat cheese dish was very different and more of a savory dessert. 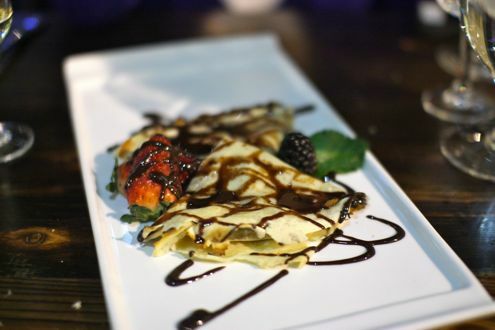 The crepe was a traditional crepe, but then again, who doesn’t love crepes? While this does seem like a lot of food, keep in mind that they were all small plates. It would be great to come back here with a group to try more things. 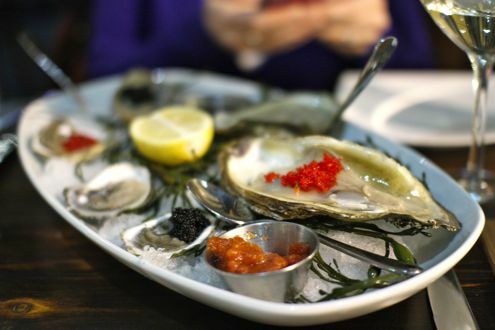 It seems like they have great happy hour deals, especially on oysters and wine. Unfortunately, we’re out of commission for happy hour these days with a baby to be put to bed and all, but we’d definitely recommend this place for dinner, drinks, or a stop before or after a game at the Phone Booth. A few weeks ago, Rachel and I had the pleasure of trying out Zengo’s new bottomless brunch. 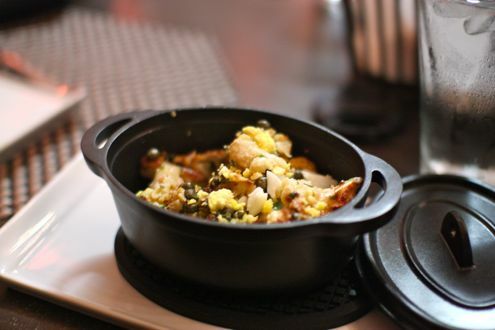 Offered both Saturday and Sunday from 11:30am to 2:30pm, diners get to indulge in a variety of Latin-Asian fusion dishes from Chef-Owner Richard Sandoval and Chef de Cuisine Graham Bartlett. Oh, and of course it’s not a bottomless brunch without endless brunch cocktails. 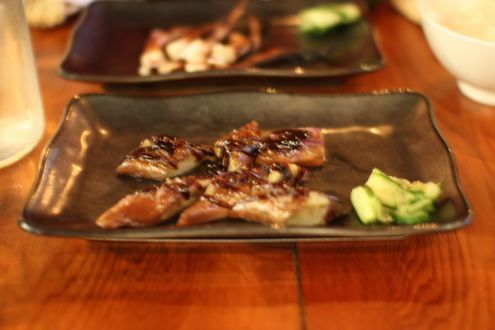 And just like Sandoval’s sister restaurant, Masa 14, the price tag of endless small plates and libations comes out to a reasonable $35 per person. 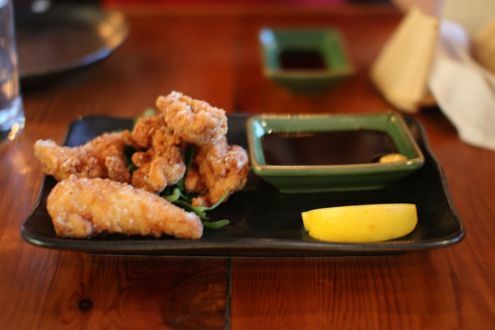 With nearly two dozen plates to choose from as well as a handful of brunch cocktails, Zengo’s brunch is ideal for groups so that diners can sample the entire menu. Considering it was just the two of us on Sunday, we tried our best to order the dishes that sounded the most appealing without having to roll us out of the restaurant. 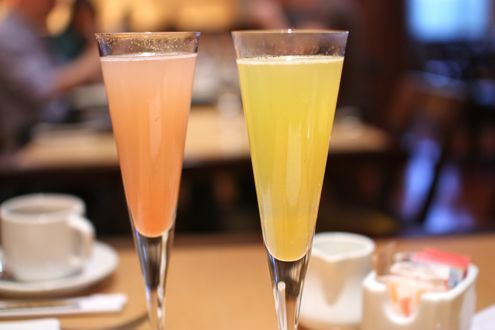 With that said, we started brunch with a pair of mimosas – traditional and passion fruit. Our first dishes were a duo of ceviches. 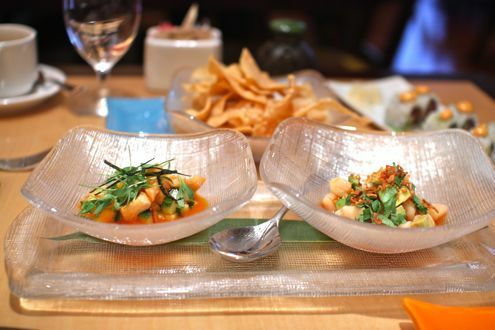 The Bay Scallop Ceviche was comprised of Thai chile, avocado, peanut, mint, and crispy shallots while the Ceviche Dorado, our favorite of the two, featured mahi mahi, aji panca, kimchee, cucumber, and cantaloupe. 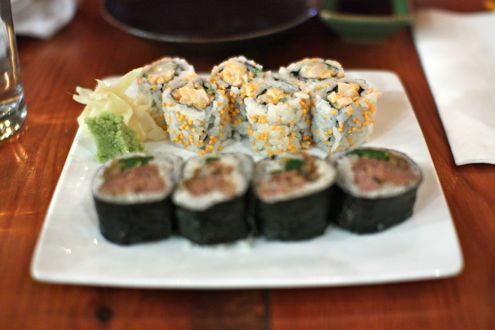 And while sushi isn’t typically considered brunch fare, Zengo whips up an excellent spicy tuna roll, dubbed the Angry Zengo Roll. 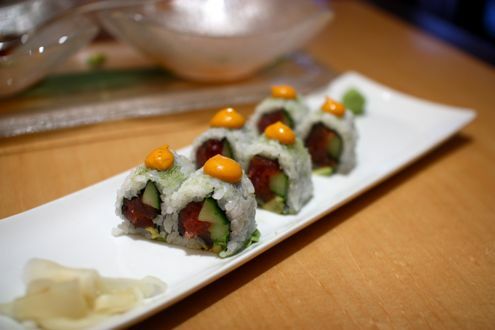 Made with wasabi, avocado, cucumber, and sesame chipotle rouille, it was an enjoyable plate of maki. One of the day’s highlights (at least for me) was the short rib hash, made with poached eggs, yucca, poblano rajas, and caramelized onion. 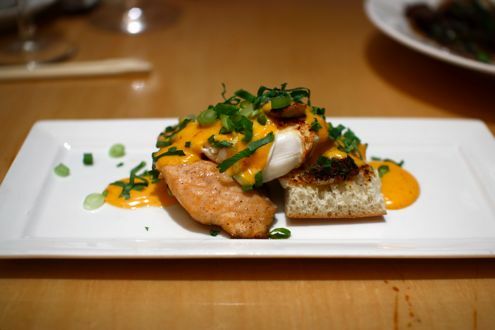 Up next was a salmon benedict, made with poached egg, ciabatta, kimchee, chili, and hollandaise. 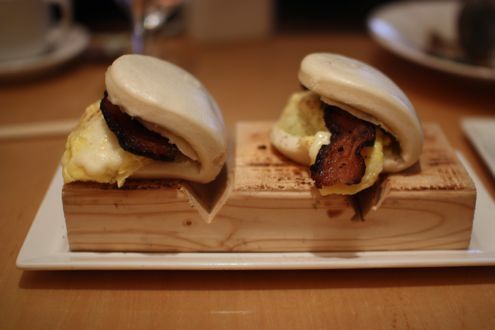 One of our favorite dishes was the bacon and scrambled egg steamed buns. Topped with Oaxaca and salsa verde, the buns were delightfully soft and subtly sweet. Perhaps the richest item of the day wasn’t even a small plate, but a side dish. 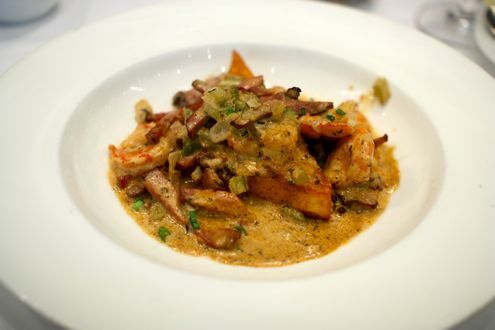 Regardless, the lobster grits are a must-order. 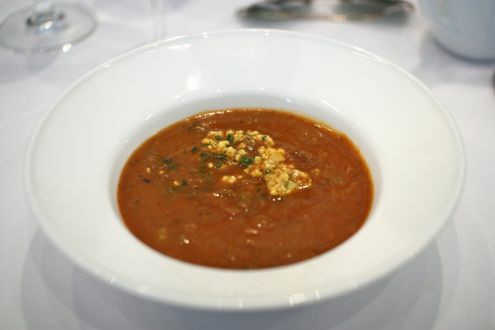 And don’t let the title fool you – it was more of a lobster bisque given how thick and creamy it was. Still, it was a hit nonetheless. Next was the Peking Duck Chilaquiles. One of the more interesting concoctions of the day, it was comprised of fried egg, pickled onion. guajillo salsa, cotijacrem, and corn tortillas. 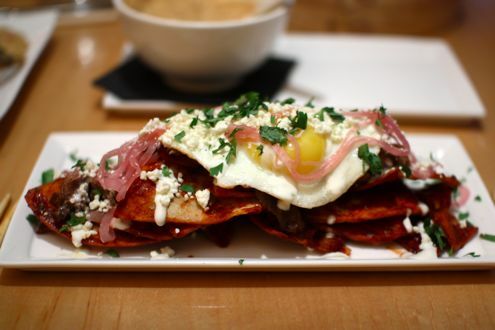 If you’re nursing a hangover, this is probably a dish you’d want to order. 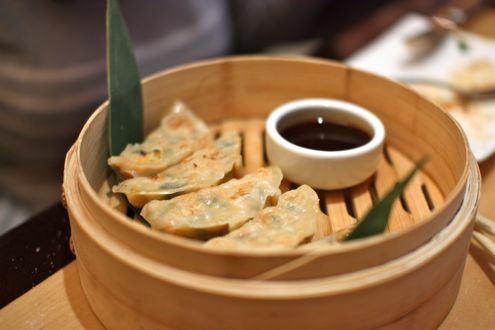 The shrimp-vegetable pot stickers, accompanied with chile-dashi sauce, were a nice way to close out the main portion of the meal. As for dessert, we thought the churros were excellent. 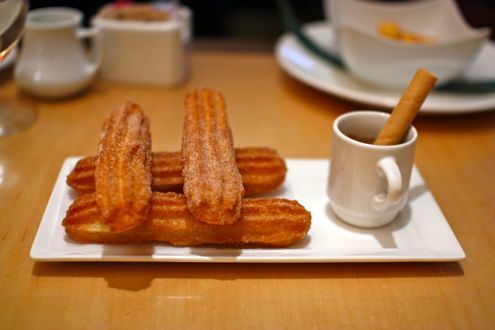 Served with a side of Mexican hot chocolate and artfully presented, the rich, slightly spicy chocolate sauce complemented the crispy quartet of churros. 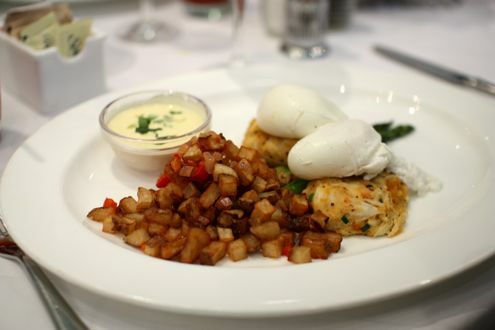 Given the $35 price tag, it’s a value-packed brunch when you consider the unlimited small plates and beverages. Dishes did come out in waves, so be prepared when your table receives a multitude of items at once as it can get slightly overwhelming. 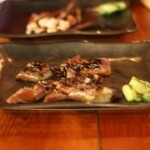 Overall, we really enjoyed what Zengo had to offer. Not only was the service excellent, but it’s also incredibly convenient given that Zengo sits atop the Gallery Place Metro. 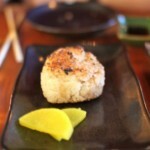 If you’re looking for a good group outing for bunch, Zengo is a solid choice. When we made a reservation for PS 7’s a few weeks ago, we had no idea that Chef Peter Smith would be transforming his restaurant into an Italian Trattoria the very same night. In fact, we had only found out just a couple of days prior thanks to Eater, but if anything, it made our dinner plans even more appealing. When we arrived at the restaurant, PS 7’s had gone into full pop-up mode. 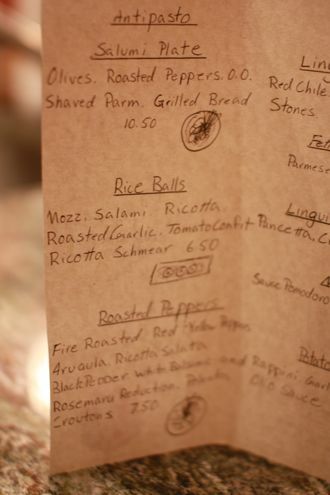 The tables were adorned with red and white tablecloths, Billy Joel’s “Scenes from an Italian Restaurant” was playing over the PA, and the menus were replaced with handwritten ones featuring Italian dishes inspired by Smith’s great grandmother, complete with illustrations scribbled in pen. It felt very authentic. 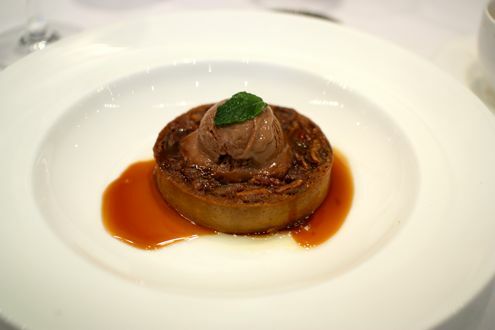 The full menu was also available, but it proved difficult not to partake in the festive atmosphere given the exclusive dishes being served that night. On top of that, the menu also featured its own wine selection as well as several desserts. For our first course, Rachel ordered the roasted peppers appetizer. 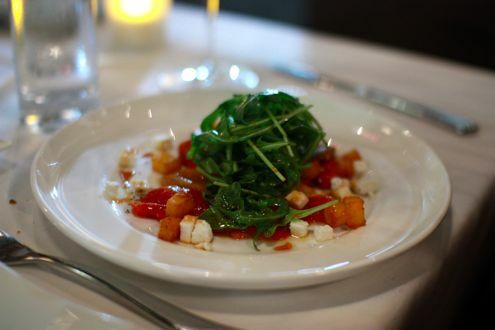 Featuring fire-roasted red and yellow peppers, arugula, ricotta salata, black pepper, and drizzled with a white balsamic and rosemary reduction, it was a nice way to start off our Italian meal. The best part, however, might have been the polenta croutons. 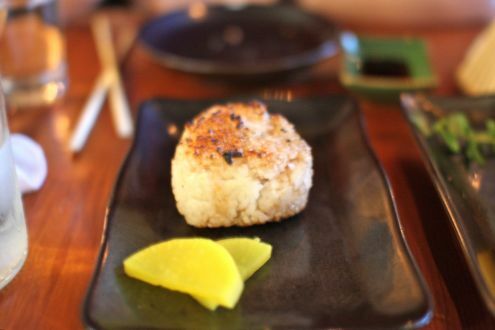 I went with the rice balls, or Arincini. While I’m partial to the ones found at Taylor Deli, Chef Smith’s rendition took it to the next level. 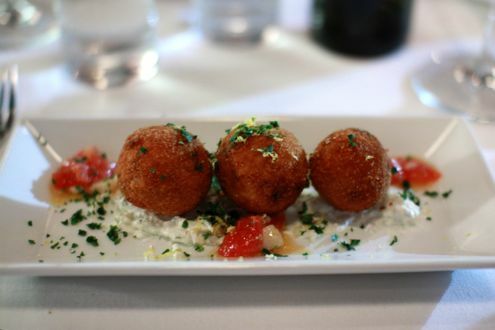 Comprised of mozzarella, salami, ricotta, roasted garlic, tomato confit, and a ricotta schmear, the Arincini were nicely crisp on the outside and completely savory on the inside. 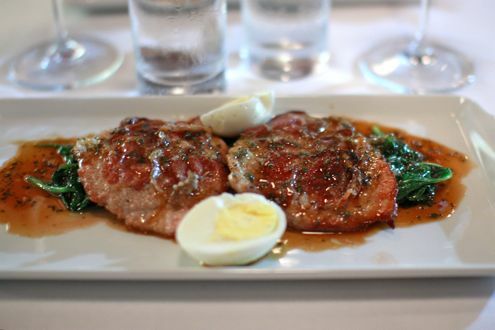 As for our entrees, I went the traditional route with the veal saltimbocca. Topped with slices of house-cured ham, and accompanied with a hard-boiled egg as well as a side of spinach while sitting in sage sauce, it really exceeded my expectations. The veal was excellently cooked, tender, and full of flavor. Combined with the fact that you received two cutlets for a very reasonable price of $18, it proved to be an incredible value. 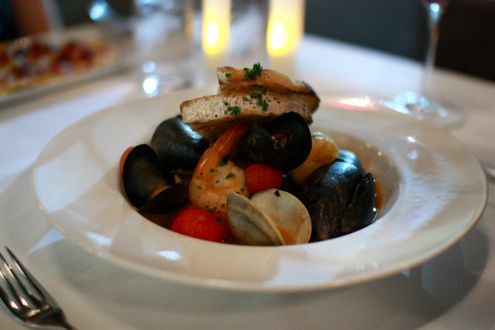 Rachel ordered the zuppa di pesce, which included clams, mussels, shrimp, and calamari, all sitting in a bowl of shellfish tomato broth. She loved the richness of the broth but thought it was just a tad too salty. The seafood was delicious but felt that the bread was a little too oily. She only wished that there was more seafood or even some pasta to accompany it. As much as we wanted to continue the Italian theme, we went against the grain and ordered dessert from the regular menu instead. 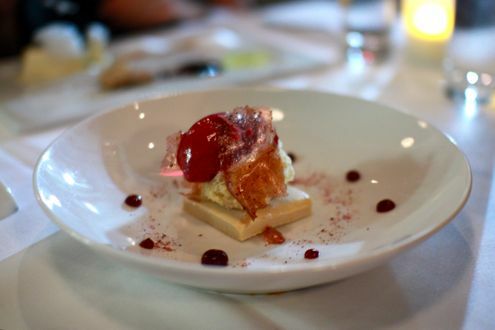 PS 7’s is particularly known for its desserts thanks to pastry chef Lauren Whitledge, and let me you, she did not disappoint. We decided to share three of her dishes amongst our table so we could try a bite of each. First up was the Lemon Ice Box. 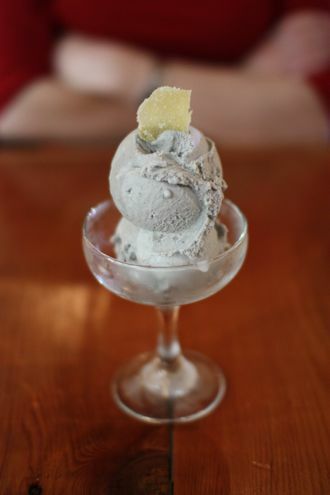 If you’re a fan of all things lemon, then this might prove difficult to pass this up. 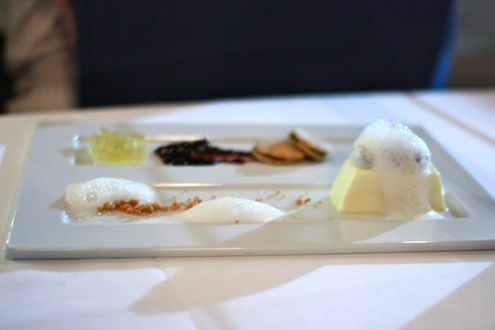 Featuring blueberry jam, lemoncello gelée, and lemon custard, just the presentation alone was stunning. This might have the unanimous favorite with the table. Up next was the P.B. & J. Comprised of peanut butter crème, peanut sponge, and concord grapes, it was by far the richest of the three desserts. It was a great interpretation of the lunchtime favorite, though Rachel felt that the grapes were a little overpowering at times. 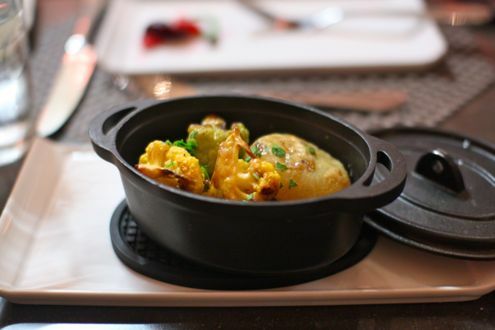 Still, it was a fun, imaginative dish that you wouldn’t be able find at other places. 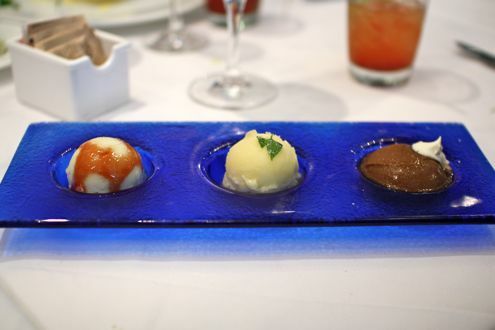 We decided to keep it simple with our last dish, a sorbet trio. 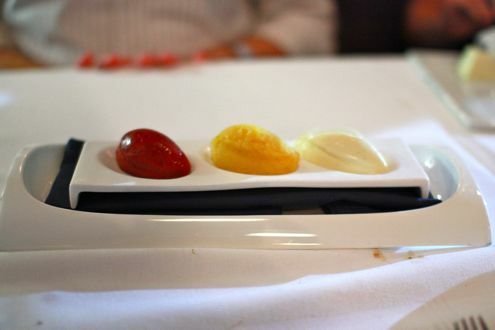 While it might have been the least creative dessert of the three we ordered, the flavors were some of the best. Seriously, this is some excellent sorbet. 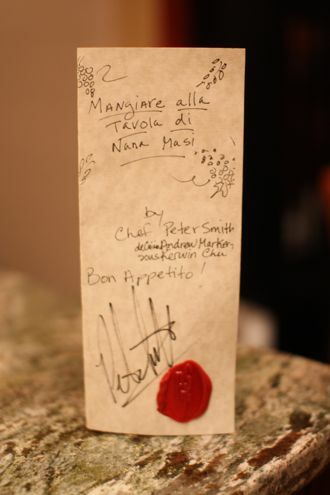 Featuring raspberry, mango, and lavender, we were all wowed by the taste as well as the texture. 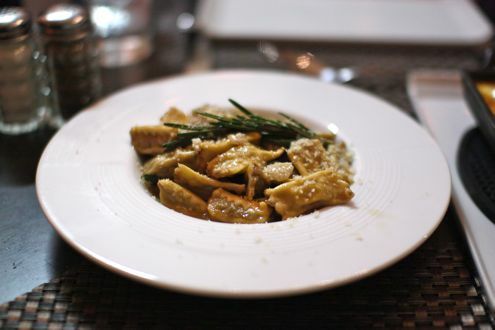 All and all, we felt that PS 7’s trattoria concept was an unqualified success. I have to admit, I was a little skeptical how the dishes would turn out since this was the first time they were running this event, but the saltimbocca tasted like the chef had been cooking it for years. The whole concept was executed very well, and what’s even better was that the prices were substantially less than what is offered on the regular menu. 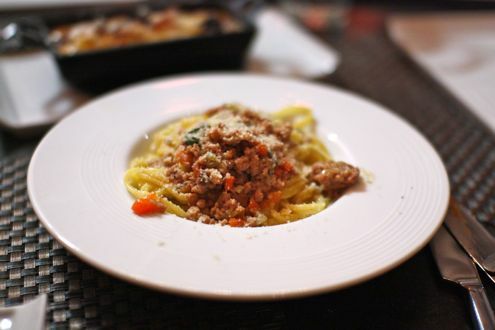 PS 7’s has hosted their trattoria event twice now, and we hope that it continues. They served up some fine Italian cuisine that evening, and while they might be known more for their ahi tuna sliders and housemade hot dogs, I hope it’s not the last we see of that saltimbocca. 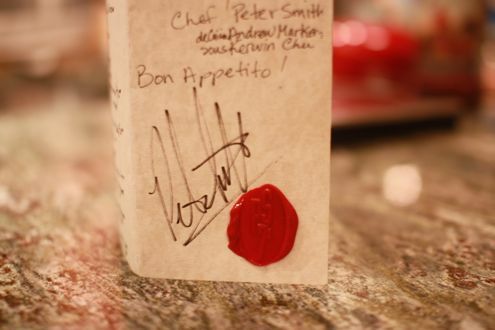 It’s not often that we write about a restaurant as soon as it opens, but Mike Isabella’s Graffiato was about as flawless as a debut as we could have imagined. 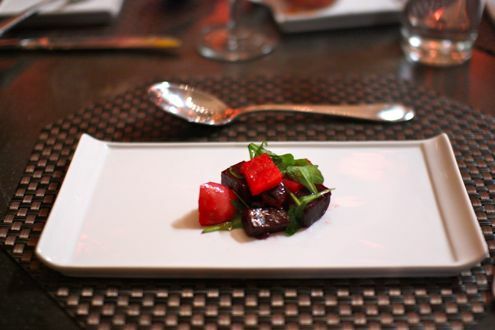 Even though the Top Chef alum’s restaurant has now been open for several weeks, we have heard such positive word of mouth that we were eagerly counting down the days until our reservation last Wednesday night. With our friends Pat and Fraser, we headed to Chinatown while discussing our game plan on what to order. When we arrived, the place was full to the brim but we were immediately seated by the hostess after checking in for our 8:30pm reservation. The modern yet simple interior was very inviting, and with two floors of space with a kitchen on each floor, Graffiato can certainly accommodate many guests. Once we were seated upstairs, the four of us deliberated over ordering a la carte or getting the tasting menu for $55 per person. The tasting menu limited us to four courses, and while everyone would receive different plates, we still wanted to have the freedom of choosing our own dishes as we went along. Thus, we went the a la carte route. I don’t think any of us could imagine sharing 16 dishes! Of course before ordering our food, the ladies couldn’t resist indulging themselves with a few glasses of prosecco. And how could you blame them when it’s the only venue in the city serving the sparkling Italian wine on tap? They also carried several local brews including DC Brau and Port City. Even though Isabella is from Jersey, Graffiato gives off a sense of DC pride as it sources its ingredients from nearby farms and vendors. 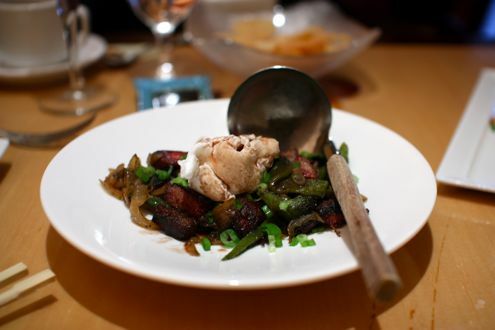 It emits an authentic neighborhood vibe despite Isabella’s nationally known mug from Top Chef. The fact that Mike himself was making rounds with customers all night made you feel at home which resulted in a nice, laid-back atmosphere. Sorry for going off tangent – let’s get onto the food! 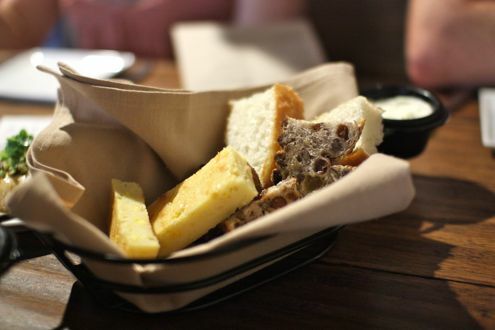 Up first was the bread basket which featured polenta, focaccia and raisin bread, along with olive oil jam and fresh ricotta. If this was a taste of what was to come, then we were in for one heck of a meal. All four of us devoured the freshly-prepared bread while scraping the ramekin clean of any leftover ricotta. Our only negative comment would be the fact that bread isn’t included and will cost you $5, but maybe they are going for a European feel there. 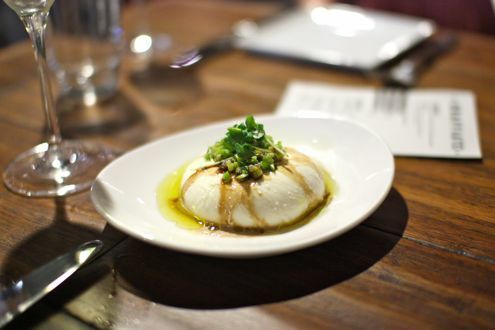 Next was the fresh stretched mozzarella with fava bean relish. This was one of my favorite dishes of the evening. I have never tasted mozzarella so fresh with such an engaging texture. Well done, Mike. 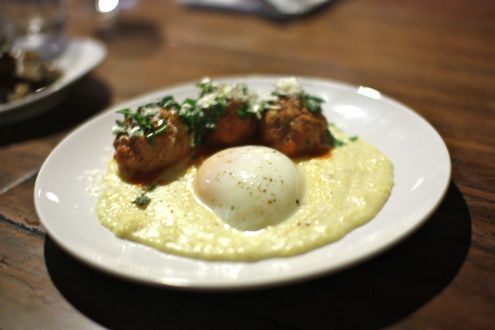 Following the excellent mozzarella was the polenta, accompanied with three spicy pork meatballs as well as a soft egg. 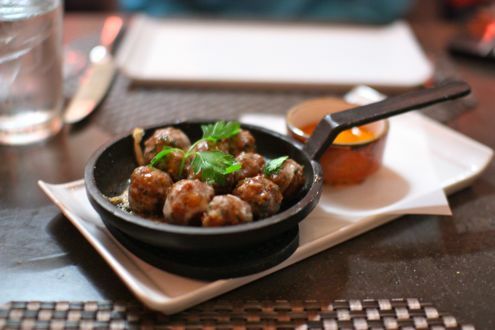 I really enjoyed the meatballs even though they seemed to fall apart a little too easily. 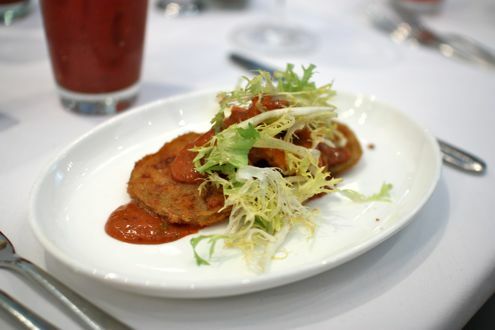 Blending the over-easy egg with the polenta and meatballs created a rich sauce which made the dish even more pleasurable. 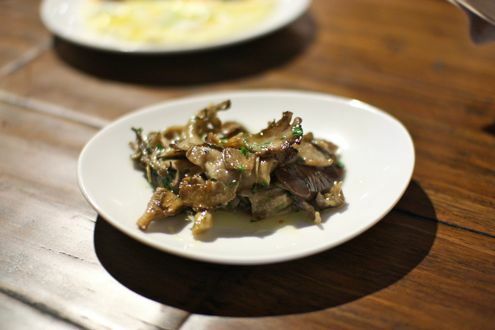 The next plate was wood-roasted mushrooms with cherry peppers and mustard. While this should have been served earlier given the complexity of the previous dish, plus the fact the fungi are served cold, it was still another solid choice. The mushrooms were rich in flavor and were one of Pat’s favorite items of the night. Our collective heads then turned towards the chicken thighs featuring Chef Isabella’s infamous pepperoni sauce. In all honesty, it didn’t quite meet the hype after Gail Simmons gushed about it back on Top Chef. That’s not to say it wasn’t good, because it most certainly was, but it wasn’t particularly mind-blowing. It more or less had the taste and consistency of wing sauce (we thought it would be thicker), but with a hint of pepperoni. The chicken, however, was excellently cooked. While the pepperoni sauce was slightly underwhelming, our next dish shot us right back to euphoria. Words cannot express how delicious the gnocchi was. Just order it – you can thank us later. Served with braised pork shank and burrata, this dish was simply exceptional. 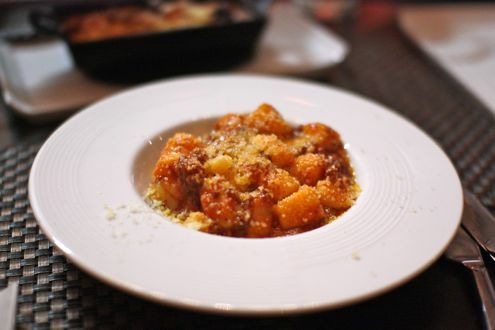 The gnocchi was extraordinarily delicate while the pork was the perfect complement to Isabella’s pasta. Kudos to the chef on this one. Our first pizza of the night (yes, we ordered two) was the Jersey Shore. Featuring fried tomato, provolone, cherry pepper aioli, and pieces of fried calamari placed atop each slice, this wasn’t your average pizza. The ingredients were fun, but there just wasn’t that much flavor coming out of the pizza. The calamari provided a nice, crunchy touch while the aioli almost tasted like the spicy mayo you would find on a California roll. At least the crust was nice and crispy, but as a whole, it was just lacking something. 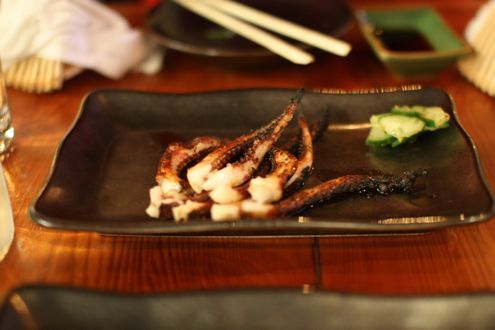 Following the pizza was the wood-roasted octopus. 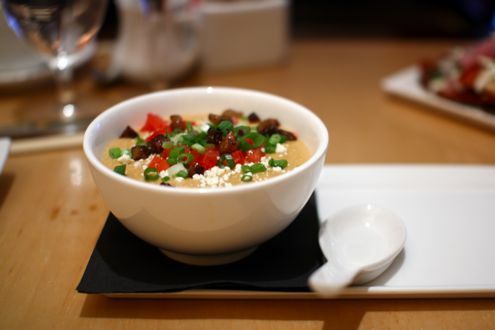 Served with chickpeas and baby artichokes, we thought it was just average. 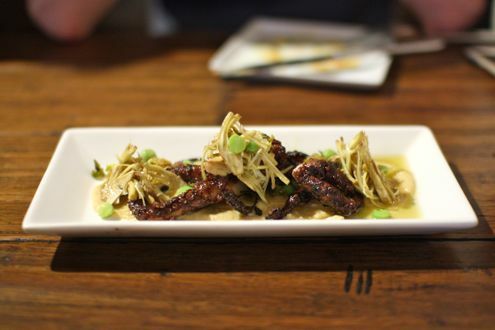 In fact, I might have enjoyed the artichokes and its sauce more than the octopus. 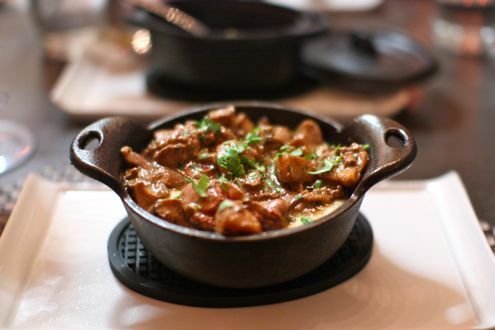 While nicely cooked, it lacked a distinctive char flavor that set it apart from superior versions found at Cava and Isabella’s old haunt Zaytinya. Up next was the bone marrow. 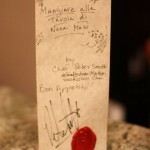 While Rachel and I had never had marrow before, Pat and Fraser recently ate it at Marrakesh and wanted to try it again. 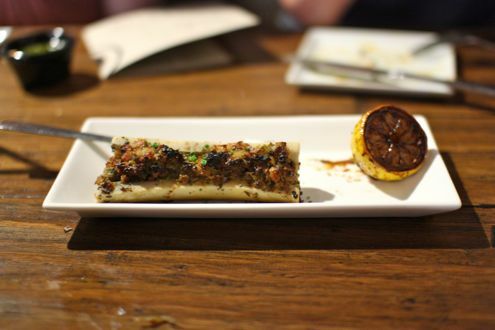 Served inside a split-open bone, the marrow was stuffed with pistachio, bread crumbs, and bacon crumbles. It was granular in texture and incorporated a bacon flavor that was a tad overwhelming at times. Interesting dish, but I’ll probably pass on this one next time. Our second pizza of the evening, for a lack of a better term, knocked it out of the park. 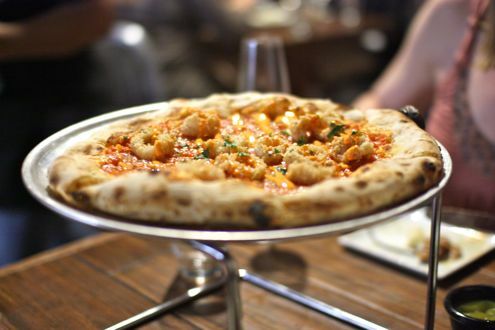 If you should order one pizza when dining at Graffiato, we highly recommend the Countryman. I’m glad our waiter purposely served the Jersey Shore first, as the Countryman was just on a whole other level. 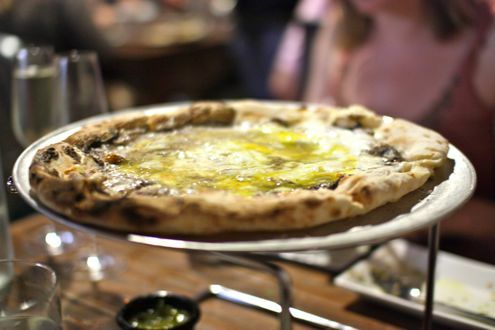 Topped with black truffles, fontina, and a duck egg whose yolk is spread over the surface by our server, this felt like you were eating deliciously rich pasta that happened to be on top of a pizza crust. 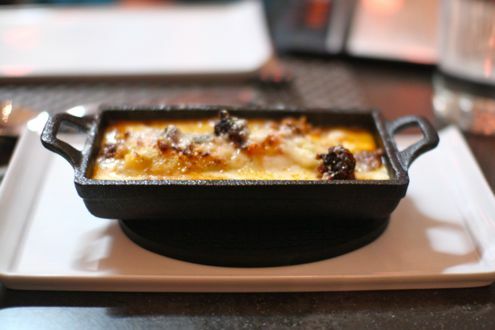 Between the gooey egg yolk, robust fontina, and subtle hints of black truffles, it was a hit amongst all four of us. 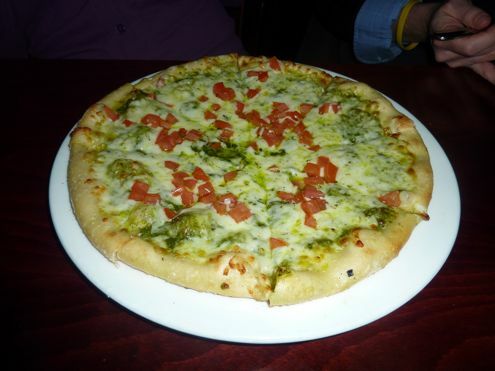 We have heard good things about the White House pizza too and may have to get that one next time as well. 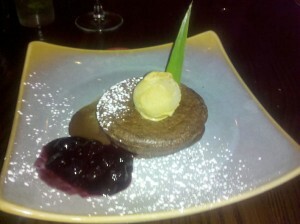 We somehow still had room for dessert, so we ordered the chocolate tart as well as the unlisted zeppoles. Yes, the latter is not on the menu, but within less than a month it’s already achieved “Animal Style”-like status where it’s a secret but, well, not really a secret. One reason why the zeppoles are not on the menu is because they are cooked to order, and they do take some time before they ultimately reach the table. It was well worth the wait, however, as they were purely outstanding. 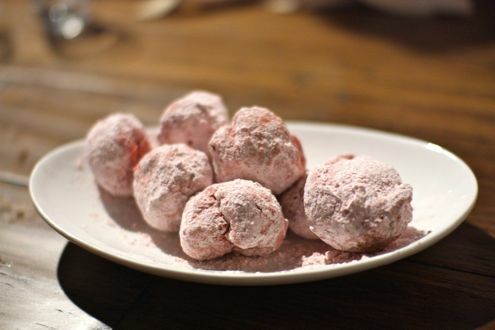 These fried dough balls, dusted with strawberry flavored powdered sugar, were piping hot and utterly delightful. 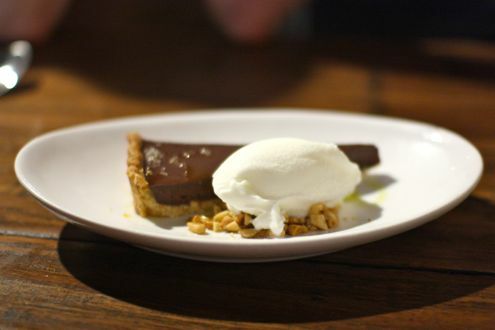 Meanwhile the chocolate tart was accompanied with olive oil and sea salt gelato, which gave the dessert a nice balance of sweet and salty. The tart even had some saltiness to it, but in the end, I think the zeppoles might have been our favorite of the two desserts. Overall, we walked away very impressed with Graffiato. It’s a positive sign when even our least favorite dish was still good, you know? 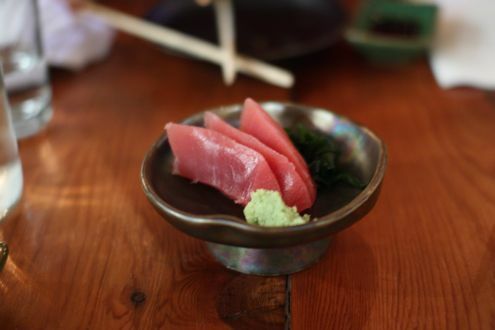 The service was first-rate, the atmosphere was pleasant, and the food was consistently great. 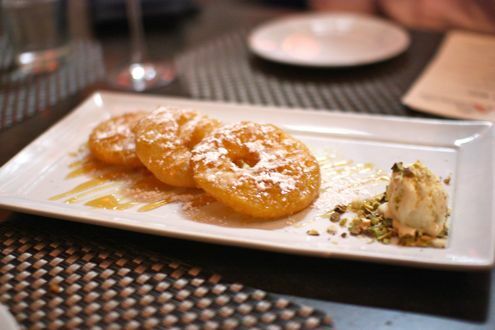 We honestly cannot wait to go back and try many more of Chef Isabella’s dishes, as long as we order the gnocchi and zeppoles, of course. ‘Tis the season for games, games, and more games. My friends and I decided to meet up for dinner and drinks last week, and what better place to watch some March Madness games than at the new Redline Gastrolounge right across from the Verizon Center. My friends Alicia and Matthew got there early and we were able to secure a table after waiting a bit at the bar. Sadly, we did not get one of the coveted booths with table top beer taps. We were staring at the nearby tables in jealousy, as the idea of having the ability to pour as much beer as you wanted without having to wait for a server was very appealing, but also dangerous. We couldn’t tell if you had the option of switching the taps as we would have preferred Dogfish over Bud Light, but it was definitely a cool idea. With our drafts glasses in hand, we ordered our food and took took in the sensory overload of games and TVs all around us. I decided to get the pita tuna sandwich, with grilled Ahi tuna, toasted sesame seeds, avocado, and cucumber sauce. I asked if they had anything other than tater tots or fries, and the vegetable option turned out to be what looked like a bowl of fajita veggies. The sandwich itself was huge, and although it was somewhat messy, it had a great combination of rare tuna with the spicy sauce and creamy avocado. 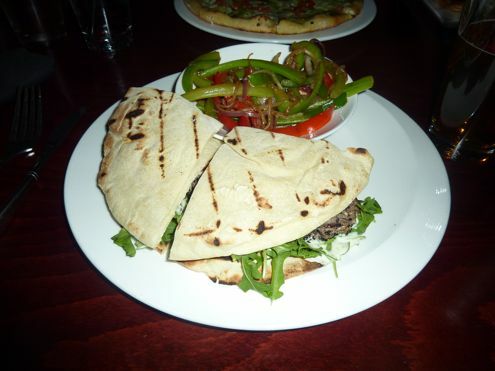 The pita was more sandwich-like than a pita pocket, so it fell apart quite a bit, but it wasn’t too heavy or overpowering. The vegetables were okay for what they were, but I should have just stuck with the tots. Alicia got a make-your-own pizza with pesto sauce, cheese, and tomatoes, and while I didn’t try any, it looked like a respectable size for a personal pizza. Matthew ordered the pulled pork sandwich and I don’t think he had any complaints, although it looked quite small compared to my giant pita that took up almost the whole plate. I have to admit, I was a little skeptical about Redline given the mixed reviews. However, considering we visited during one of the busiest sports watching periods of the year, our food arrived promptly and it was a fun, if not incredibly loud, atmosphere for checking out games with friends. Just don’t expect to hear too much of each other’s conversations! Redline is located at 707 G St. NW in the Chinatown neighborhood of Washington, DC. 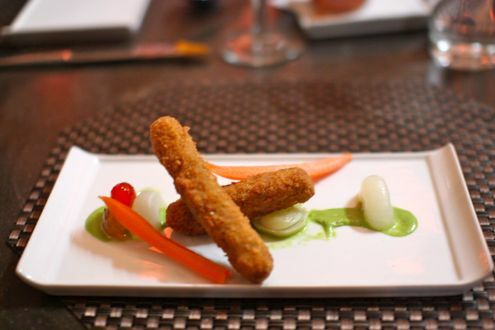 There has been buzz growing for quite some time about Cuba Libre, a new upscale Cuban restaurant in Penn Quarter. The mini-chain has other locations in Atlantic City, Philadelphia, and Orlando, but this is the company’s first foray into DC. When we heard that not only were they opening October 1st, but that for the first week all food items would be 50% off, we snagged a reservation on OpenTable right away. We somehow were able to add our friends as well, so the four of us ventured there on Wednesday to check it out. We arrived for our 8pm reservation and the place was packed, notably with people crowding the bar area. The place itself is pretty impressive, with balconies overhead and colorful walls that made it look like you’re stepping into Havana, not that most of us would know what that looks like given that we’ve never actually been to the Caribbean country, but I digress. 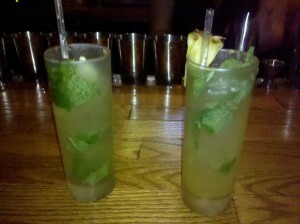 While waiting for our friends we decided to try some of their supposedly famous mojitos. There are 14 varieties to choose from, as well as specialty cocktails, caipirinhas, an extensive rum menu, and of course beer and wine. 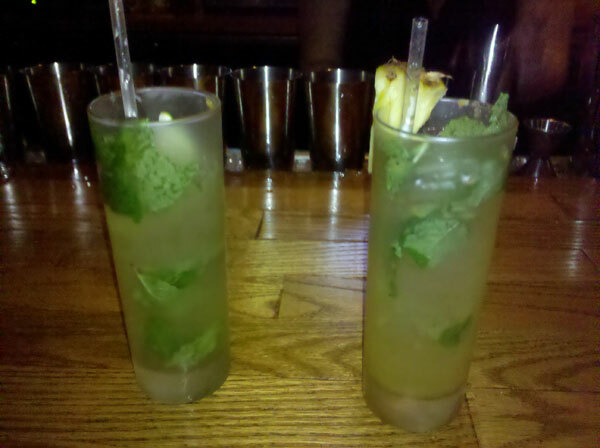 I decided to try the grilled pineapple mojito after hearing a recommendation from a friend on Facebook, and Brett went for the classic variation. They even had flavors such as an energy mojito with Red Bull, and one that included basil and beet puree. Both of ours were tasty, but I definitely think I liked mine better of the two. 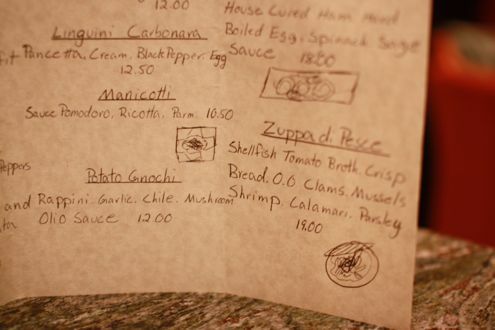 The menu is broken out into Piqueos, or small tasting plates, aperitivos (appetizers), ceviches, and entrees. 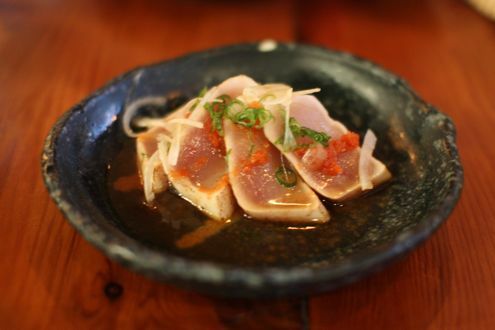 We were told that the ceviche is what they are known for, and the James Beard award-winning chef of the chain even has a cookbook dedicated to them. So we opted for the sample of all five varieties. Normally, we would have just left it at that, but since in the back of our minds we knew everything was half price, we decided to also go for an appetizer of Mariquitas Cubana, which was essentially a trio of dips with different chips to try. 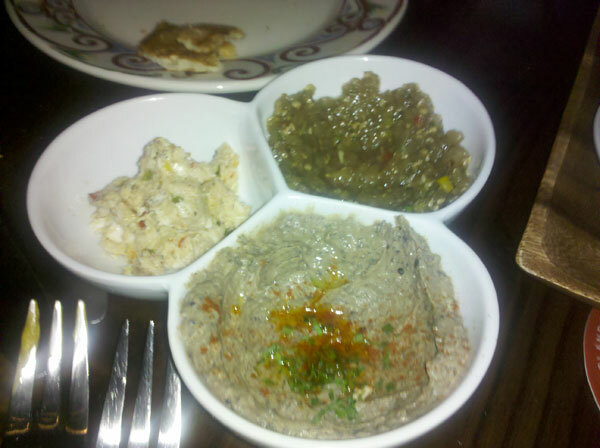 The dips were a black bean hummus, rum-cured smoked marlin salad, and Haitian eggplant spread, essentially a play on Mediterranean dips. The chips were plantain, malanga, and yucca, and looked like large Terra chips to me. We figured the ceviches would be smaller since it was a sampler, but we were able to taste each one. They included smoked salmon, diced tuna, scallops, shrimp, and Maryland lump crab. It was nice to see a local touch on the menu with the crab, although we were skeptical about how it would taste in a ceviche. Some were definitely better than others. The salmon had roe on top and a dusting of popcorn which provided an interesting flavor combination, but the winners in our opinion were the scallop and crab ceviches. The dips were reasonable and definitely something different than your traditional hummus or eggplant. The smoked fish salad tasted more like a traditional white fish salad, something I would normally eat with bagels and lox than at a Cuban restaurant. 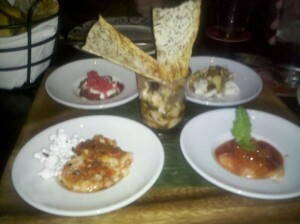 Overall, the spread was nothing spectacular and the portions of each dip were small, especially to share. For the regular price of $13, I don’t think I would get it again. 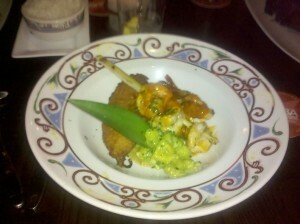 There were several different choices for entrees, with most of them being Cuban-inspired but with a twist from the chef. Again, since everything was half off, we probably looked at the menu a little differently than we normally would have as we went for the dishes that were more on the expensive end. 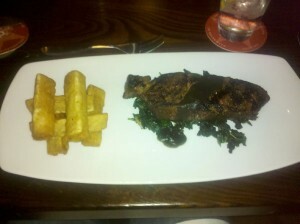 Brett got the Bife de Nueva York which was a 12 ounce strip steak with caramelized shallots, steamed kale, polenta fries and accompanied with tamarind ketchup and steak sauce. 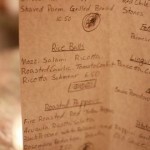 The entrée normally costs $32, and since Brett is already a steak lover, he opted to go with that. I was torn between several dishes; either the paella with black forbidden rice, whole boneless sea bass, filet of salmon, or BBQ shrimp. I decided to try the jumbo shrimp, or Camarones con Cana, which was prepared in a mango BBQ glaze. I was a little skeptical with the sides, which were listed as “crispy Anaheim pepper stuffed with creamy quinoa, sweet potato and Mascarpone cheese.” It was also served with chunky guacamole as well. The shrimp were great, some of the biggest I’ve seen, and the sauce on them had a nice flavor, especially eaten together with the guac. It was the side of the pepper that I felt didn’t really fit with the rest of the dish. I thought it would be a green pepper with some quinoa inside, but it wound up being a huge, fried jalapeno pepper with a creamy mixture within. It was essentially a giant jalapeño popper. Granted, I ate most of it, but I felt fairly ill after and thought it was way too heavy compared to the lightness of the shrimp. It might have been paired better with black beans and rice instead. Brett thought his steak was excellently cooked as the kitchen perfectly accommodated his medium-rare request. The steak was supposedly marinated but Brett thought it was more on the dryer side but was tender nonetheless. The provided steak sauce helped things as it had its own unique flavor while the polenta fires and tamarind ketchup were a nice compliment to the dish. Our friends got the paella and the sea bass and liked both of their dinners as well. This night was a case when I had food envy and wish I had chosen one of those dishes instead. Don’t get me wrong, I liked mine overall, but I think I would have enjoyed one of those better. We were all pretty stuffed at that point, but again, at half off the food bill, we thought in order to give a full report we should order some dessert too. We all shared the Torta de Chocolate y Dulce de Leche, basically a chocolate lava cake. The soufflé was layered with dulce de leche, and served with dulce de leche ice cream, a chocolate orange sauce, and blueberry compote. If I was not so full I would have devoured it, but the few bites I had were delicious. The server told us if we liked chocolate that we should get this dessert, and she was ultimately right. 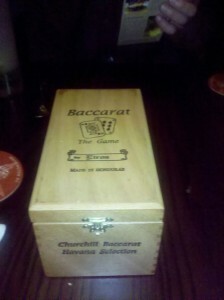 When we got our bill, it was enclosed in a large wooden box. We noticed other tables had this as well. Some tables received cigar boxes while others, such as ours, received ones suited for baccarat. We said this was something that seemed like a good idea in theory, but could increasingly get annoying with the awkwardness of carrying around boxes and having customers dig into a box to fish out different credit card receipts. We wouldn’t be surprised if they did away with it within a few months. 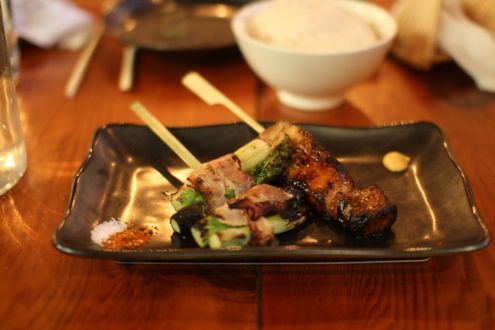 The 50% off deal is a great idea, both for the diners and the restaurant itself. Customers get a chance to try different things on the menu and splurge a little since everything (excluding beverages) is discounted. The restaurant is able to feel its way the first week or two if some dishes are a miss as well as hear feedback from the diners. Plus, if service is bad or if something is off, it’s hard to complain when you’re getting such a great deal. The 50% special is over, but you can still take advantage of 25% off food items from October 8th through 13th. 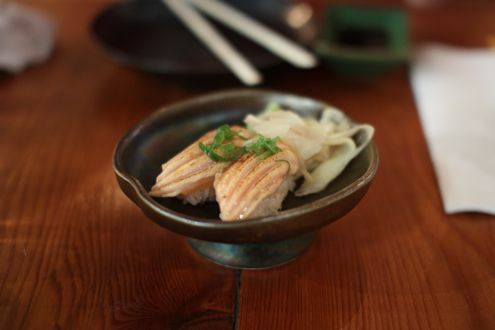 Overall, we felt it was a fun, new addition to the DC dining scene. 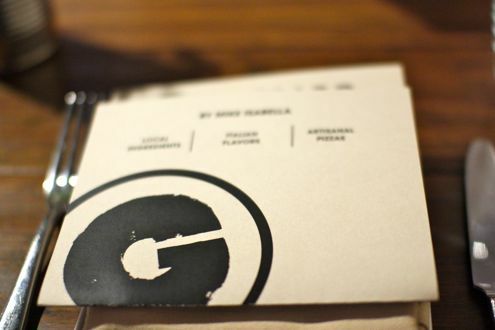 The service was fairly slow and a little uneven, but we’ll chalk that up to first week opening craziness. One thing that was a big turnoff was the kitschy Cuban music in the background. It was loud and distracting, and didn’t add anything to our dining experience. The food was good and unique, but didn’t wow us by any means. 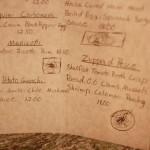 Looking at what the prices normally are, we all agreed we would be hard pressed to come back and order the same dishes. 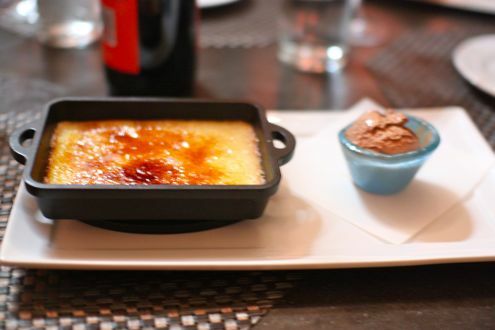 Most of them were in the upper $20 range, and while that is now becoming the standard for nicer restaurants in the DC area, some of the dishes just didn’t seem to warrant those prices. Especially with specialty drinks like the mojitos costing $10 or more, the meal could easily rack up to at least $100 or more for two people. The website currently doesn’t offer much information about the DC location outside of saying that it is officially open. You can view the menus if you go to the other cities, and they all seem to be fairly similar. I would say to definitely check it out if you’re curious, but I could honestly see myself going back more for a girls’ night of drinks at the bar than for a date night.